The support and commitment to the Winter Equestrian Festival continues to increase each year, welcoming new and longstanding sponsors to Wellington for the highly anticipated winter circuit, greeting riders of different ages, demographics and origins alike for three consecutive months. For WEF sponsors, presence at the competition offers the opportunity to further invest in the accelerated growth of equestrian sport in the United States, while simultaneously reaching the valuable equestrian market of competitors, enthusiasts, spectators and followers. Over the years, new and innovative ways to incorporate sponsor messaging and branding have been woven into the overall development of sponsorship packages at the venue and throughout the season, which include arena presence with branded and distinctive jumps, branded signage, digital and social media marketing campaigns, and interactive activations, to name just a few. The equestrian community is a tight-knit family, with many supporters and businesses continuing their involvement in the sport for many years, while fresh brands and businesses also are welcomed each season — an exciting development for the growth of the sport. 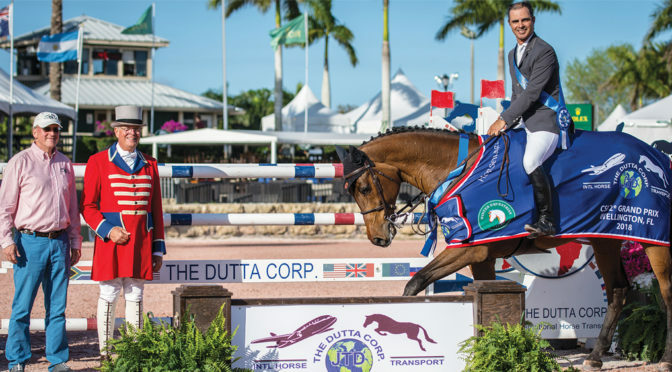 Without committed and dedicated sponsors, the sport would not be able to succeed the way it has in recent years at the Palm Beach International Equestrian Center. With each new year, equestrian sport and the season at PBIEC continues to attract more riders, horses and enthusiasts, which is a positive sign for the trajectory of the equestrian market as a whole. Sponsors are a key reason behind PBIEC and WEF’s ongoing success. The Winter Equestrian Festival would like to thank the following sponsors: Adequan, Alessandro Albanese, Animal Medical Center, Animo, Antares, Bainbridge Companies, the Business Development Board, Brazilian Court, Bruno Delgrange, Camping World, Captive One, Cargill, Champion Equine Insurance, Crown Family, Dever, Discover the Palm Beaches, Douglas Elliman, Dover Saddlery, Dutta Corp, Equine Tack & Nutritionals, Equinimity, Everglades Farm Equipment, FarmVet, Fidelity Investments, Gold Coast Feed, Griffis Residential, Gut Einhaus, Hampton Inn, Hermès, Hollow Creek Farm, Horseware Ireland, Hunt LTD, Karina Brez Jewelry, Keyes Art Gallery, Lugano Diamonds, Marshall & Sterling, Martha Jolicoeur, Maria Mendelsohn, Net Jets, Nutrena, Omega Alpha, Osphos, the Palm Beach Equine Clinic, the Palm Beach International Academy, the Palm Beach Sports Commission, Pegasus Builders, Perfect Products, Platinum Performance, Rolex, Rose Hill Farm, Rosenbaum, Rushy Marsh Farm, Solic, Sotheby’s, Sportfot, Spy Coast Farm, Triple Crown Custom, UHealth Miami, Vita Flex, Voltaire and Wellington Equestrian Realty. The Winter Equestrian Festival began Wednesday, Jan. 9 and continues through Sunday, March 31. WEF features 12 weeks of top international show jumping, hunter and equitation competition at Palm Beach International Equestrian Center. The event features 11 weeks of FEI competition, concluding with the $500,000 Rolex Grand Prix CSI 5* on Saturday, March 30. To learn more about sponsorships at the Winter Equestrian Festival, visit www.pbiec.com or contact Whitney Stahl at wstahl@equestriansport.com.